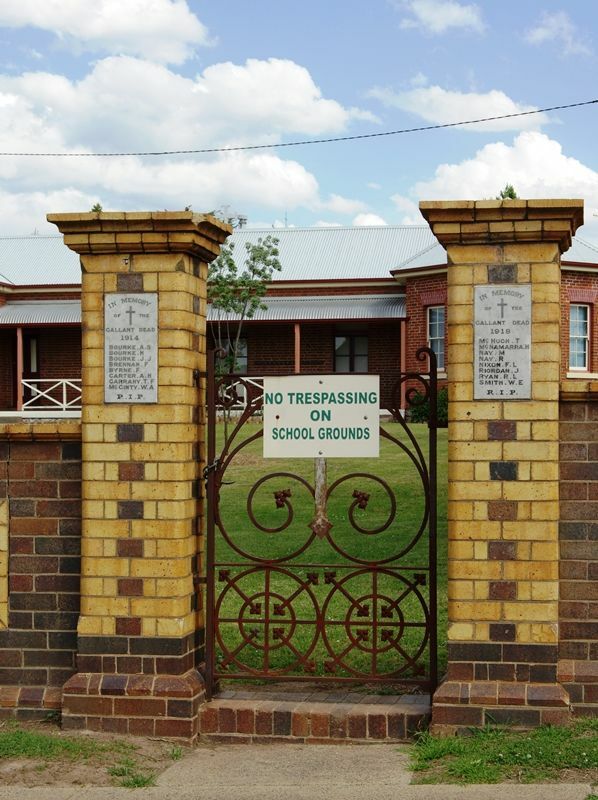 The gates and fence at St Joseph`s School commemorate those who died in service or were killed in action during World War One. 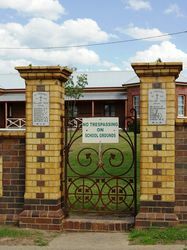 An appropriate tribute 'To the Memory of the Gallant Dead' is the beautiful brick wall and iron gate erected at St. Joseph's Catholic Church, Uralla, by the parishioners in honor of the brave young men of that community who laid down their lives in honour's cause in the Great War. One needs no special training in construction to enable one to recognise in this fine structure its wonderful stability, and surely it requires no more than natural good taste to cause one to be impressed with the grave of its proportions and its appropriate design. 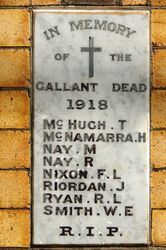 One would scarcely expect to see such work in a brick wall, but it is there a lasting tribute, not only to the memory of those fine young men who made so great sacrifice, but also to the spirit of affection and generosity which prompted their friends to have such a monument erected; likewise, to the skill of the workmen who erected it and the architect who designed it. The wall is built on a cement concrete foundation of stable section resting on a hard substratum of iron stone. The wall itself is a series of grace fully proportioned and equally distributed piers with appropriate sunken brick panels between all of specially moulded bricks of different shades of colour. The principal piers at the entrance gate have in each a white marble panel bearing the names, alphabetically arranged, of the boys who fell. Each pier has a cross near the top and the years 1914-18, then the inscription 'To the Memory of the Gallant Dead.' The names follow and the letters R.I.P. at the bottom of each panel. The entrance gate, which is of stout sectioned wrought iron, is of a special design made to the architect details. Uralla Times (NSW), 28 April 1927.